One of the problems with loving horses is that they are all mortal. 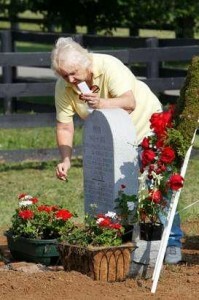 Even the ones whose names will live on forever – like Secretariat and Man O’War – have gone to the great, green fields in Heaven. Another of the greats has just joined them. Gulch was a true champion. 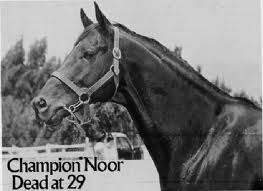 He was a tough competitor who raced against the best of his generation (which was one of the best group of horses in history). I was lucky enough to see his gritty win in the 1988 Breeders’ Cup Sprint. 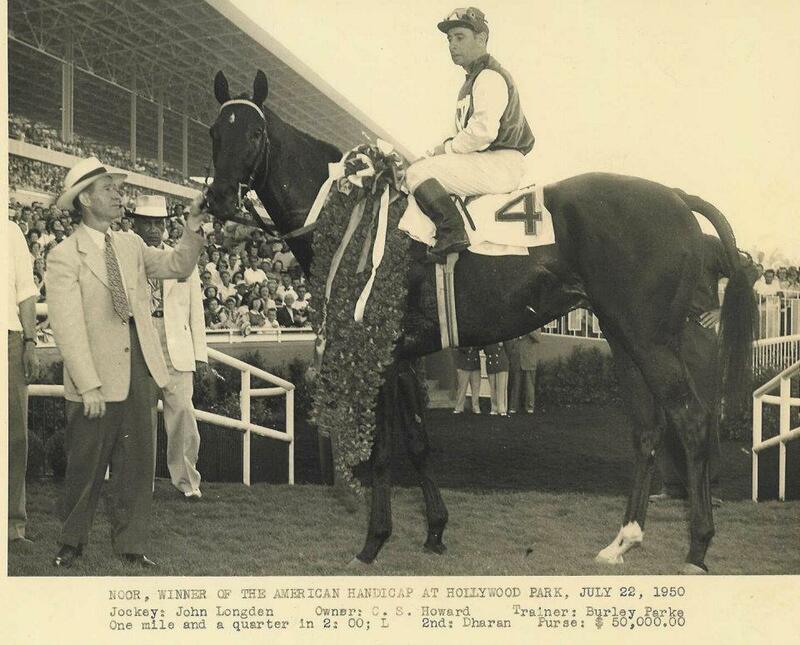 That was the year he won the Eclipse Award (the highest award given to a horse) as Champion Sprinter. 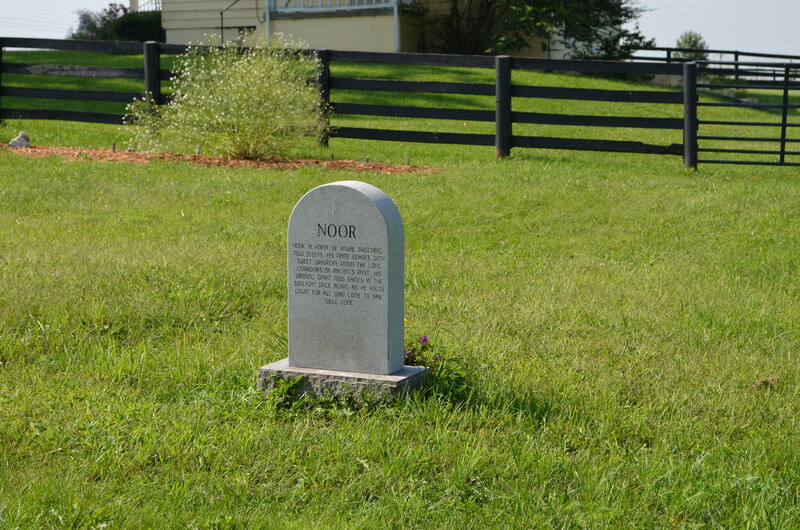 It was also his last year to race before going to stud at Lane’s End Farm (where he would stand his entire career). But I’m getting ahead of myself. Gulch was foaled (born) April 16, 1984. 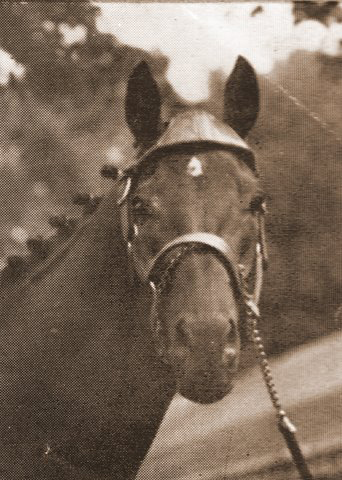 He was the son of perennial, number one sire, Mr. Prospector. His dam (mother) was Jameela. 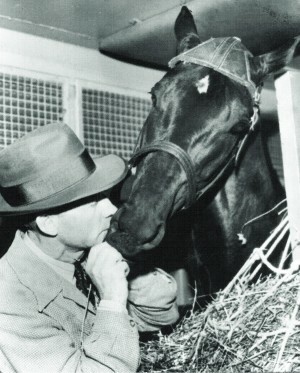 Mr. Prospector is well known for his amazing history for siring top class runners (i.e., Fusaichi Pegasus, Forty Niner, and Seeking the Gold, etc.). His continuing sire line (through sons such as Fappiano, Forty Niner, Kingmambo, Smart Strike, and, of course, Gulch) is one of the most enduring and successful in the history of thoroughbred breeding. His prowess at siring top-notch broodmares is also well documented by being the top broodmare sire for many years. Jameela was, by far the best runner her female family had produced for generations, and was also the best runner her sire ever had. 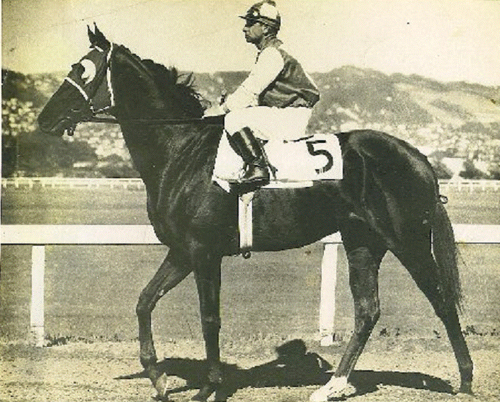 The hard-knocking mare competed for four years and compiled a race record of 58 starts, 27 wins, 15 seconds, and 6 thirds for a whopping earnings of $1,038,714. In today’s racing, $1-million in earnings is still an amazing achievement. Considering that Jameela ran from 1979 through 1982, her total earnings are even more compelling. As a three-year-old, Gulch continued his winning ways. 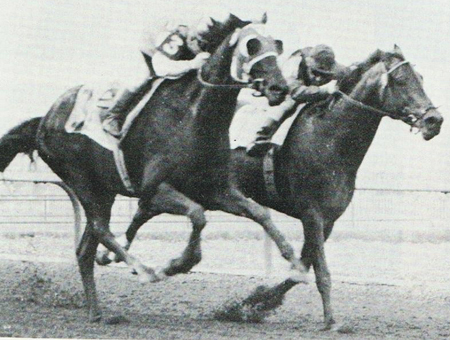 There were wins in the Wood Memorial, the Metropolitan Handicap (against older horses) and the Bay Shore Stakes. There were other great finishes besides the aforementioned second in the Belmont. 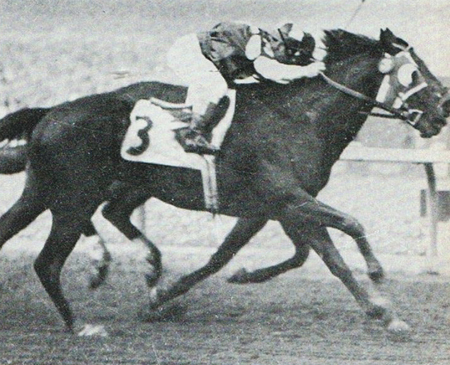 He ran against all ages in the Woodward and the Whitney (both top American races) and finished second. At four, he had his final, great year at the track with wins in the Metropolitan Handicap (for the second year), the Potrero Grande Handicap, the Carter Handicap and his tough win in the Breeders’ Cup Sprint. In addition, he had several seconds and thirds in the top races in the country. His final race record was 32 starts: 13 wins, 8 seconds, and 4 thirds for total earnings of $3,015,521. Again, remember this was the 1980s when purses were much less than they are today. He was appropriately named Champion Sprinter of 1988. In 1988, we were attending our first Breeders’ at Churchill Downs. Jim and I had recently gotten into the racing business by buying a part interest in a 2-year-old colt in Georgia. Georgia (sadly) does not have legal horse racing (an aside – some very bright lights in the thoroughbred industry are still working on rectifying that). The plan was to race this colt in Alabama and/or Florida. We also had intentions of purchasing our own broodmare to get into breeding our own racehorses. Part of that process took us to Kentucky for a sale and to go to the Breeders’ Cup races. My hero, Alysheba, was competing for the last time of his career in the Breeders’ Cup Classic; and the amazing, Personal Ensign was running in her final race in the Distaff. 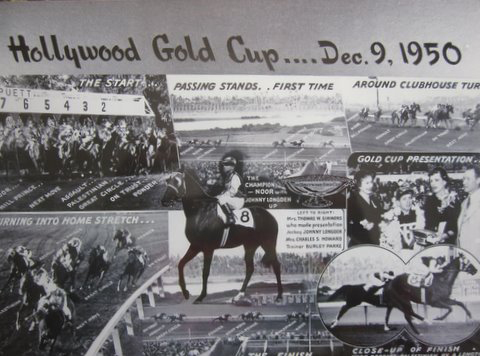 In my opinion, that year was the penultimate Breeders’ Cup. I knew about Gulch. I had always loved his name considering his sire was Mr. Prospector. He had been trained by two great trainers in Leroy Jolley and D. Wayne Lukas. I loved his gritty determination and was anxious to see him get his due by winning the Sprint. An old favorite, Precisionist, was trying to win his second Breeders’ Cup Sprint, and one of my other favorites, Sunshine Forever was competing in the Breeders’ Cup Turf. Now that I look back on that Breeders’ Cup, I’m struck that all of these favorites ended up at Old Friends Thoroughbred Retirement Farm in Georgetown, Kentucky. The next time I saw Gulch was the following May at Lane’s End. Several top runners had been retired to stud at Lane’s End and I was anxious to meet them all. 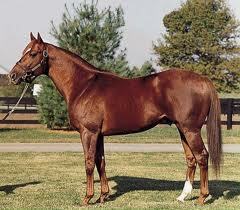 Notable among the group were Alysheba, Bet Twice (the horse who denied Alysheba’s Triple Crown) and Gulch. I knew that all of the stud fees would be far out of our reach. 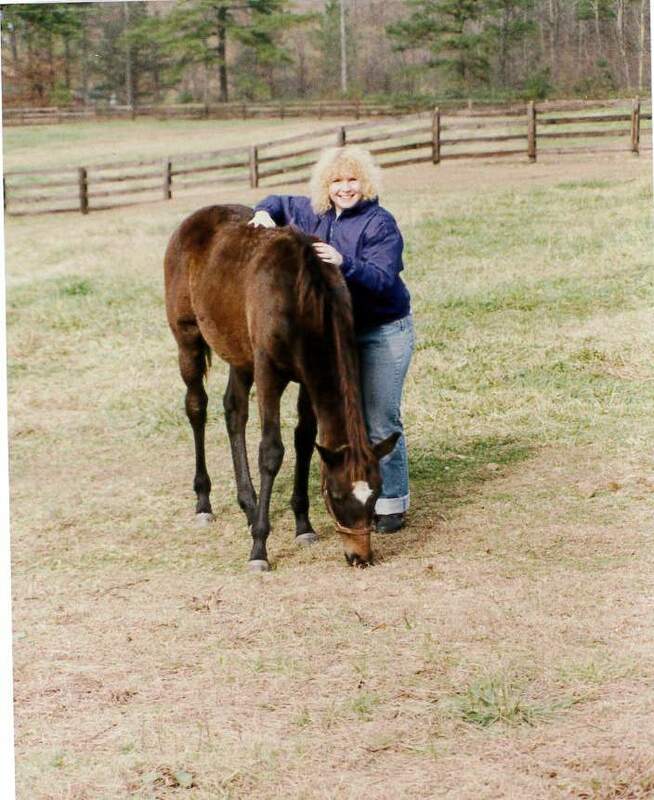 One never knows if lightning will strike, and our first mare (a half-sister to a very good horse who had run third in the Preakness Stakes) had foals that could become stakes winners. If that were the case, the scenario could change. Of course, chances were slim, but one thing for certain in the horse business – if you don’t dream, you don’t belong. I had to laugh when they brought Gulch in. Alysheba was shiny and acting much the king of the hill and enjoying all the attention. Gulch, on the other hand, looked for all the world like a sullen little boy who had been pulled away from play. Indeed, he was covered with mud, was completely disheveled, and stood grudgingly in front of us. This definitely did not look like a champion. If you’d have seen him in a group, you’d never have looked twice. But, sure enough, in front of us was the Breeders’ Cup Sprint winner and Eclipse Award winning Sprint Champion. That was the moment I decided I really loved that horse. He became a “real” horse. He just wanted to play in the mud. As a stallion, Gulch was a success. 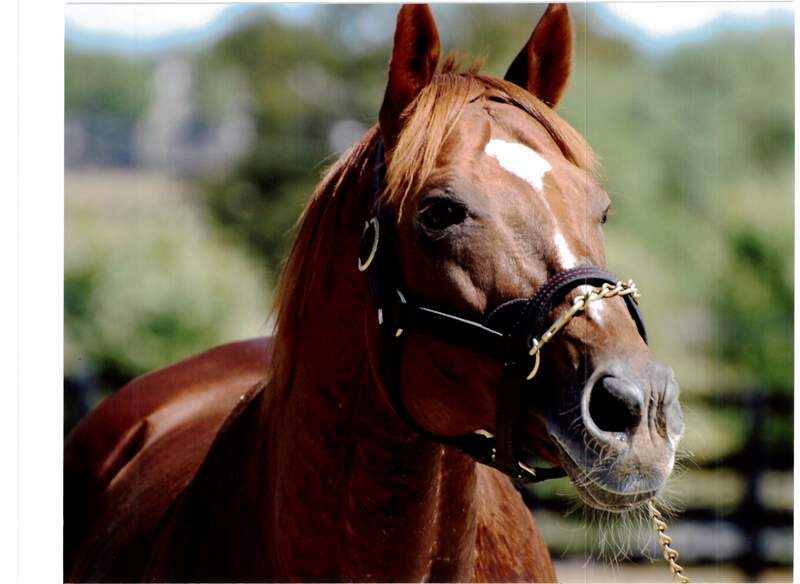 He sired Thunder Gulch who won the Kentucky Derby and who also went on to become a successful sire. Other good offspring include Court Vision, Great Navigator, and fellow Old Friends retiree, Wallenda. 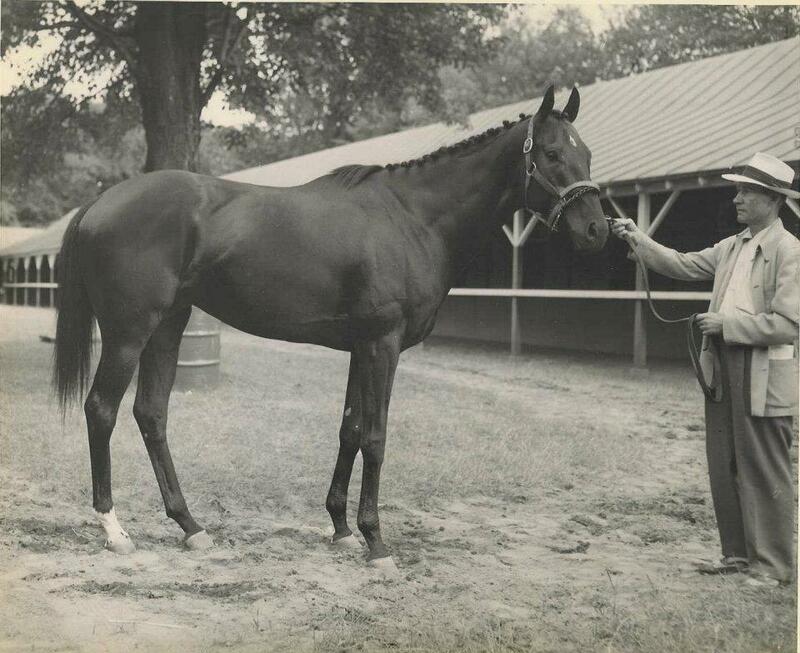 He sired more than 70 stakes winners during his long career. Several times in following years we visited Lane’s End. Each time, I’d make certain to look for Gulch. We got to see famous half-brothers A.P. Indy and Summer Squall. Lane’s End has been home to some of the best stallions in the 20th and 21st century. Still, Gulch was a favorite and I never tired of seeing him. When I heard that Gulch had been pensioned to Old Friends in 2009, I was ecstatic. 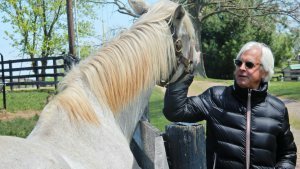 It’s been over 20 years since we were in the horse business, and our visits to stud farms pretty much ended when we left the business. With Gulch going to Old Friends I was happy for several reasons. The first was that I knew he would continue to get the best of care. Second, other fans would get to meet this wonderful horse. The most selfish reason was that I would get to visit him again. The last visit I had to Old Friends was to celebrate a landmark birthday in 2013. We planned our whole trip around making certain that we would be able to be at Old Friends on my birthday. 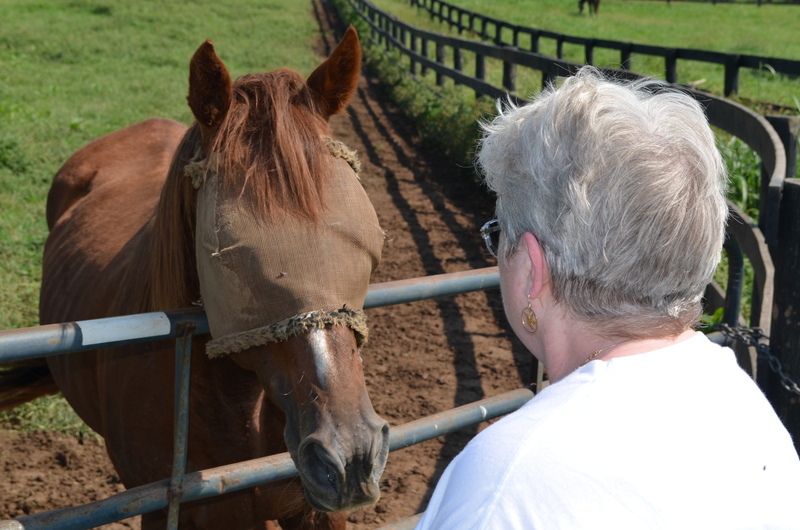 That’s all I wanted for my birthday – to be able to see all the horses that truly were “old friends” of mine. When I saw Gulch, I had to laugh. Once again, he’d been in the mud. 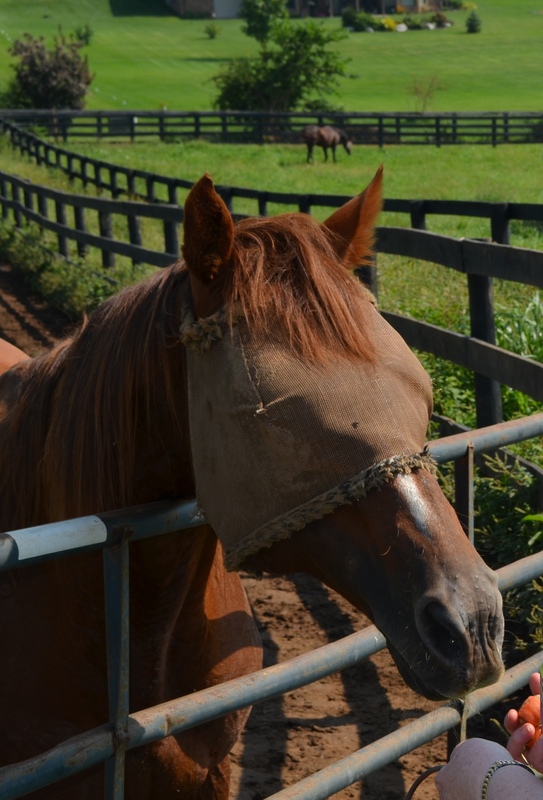 He was wearing a fly mask as the August weather and lots of rain had made for a bumper crop of biting flies. Gulch was still the same horse I’d come to know. He was friendly, but still I had to feel that he’d rather be back out rolling in the mud. So, somehow, it seems fitting that my final visit with Gulch was similar to the first. Gulch was humanely euthanized on Sunday, January 17, 2016. The gallant, old man lived to the ripe old age of 32 (which is very rare in horses). Old Friends took the step to put him down because cancer was starting to overtake Gulch and he deserved to be pain free and go quietly to sleep. One more beloved champion is racing through the never-ending fields of green (and, in Gulch’s case I hope an always-sloppy, mud hole). 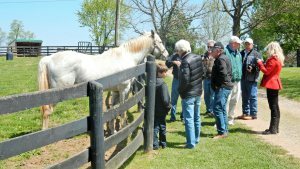 This is the next-to-last installment about our visit this past summer to “Old Friends – A Kentucky Facility for Retired Thoroughbreds” (www.oldfriendsequine.org ). Those of you who have been following my blog for a while know that we were in the thoroughbred breeding and racing business for a few years. That business brought me some of the highest highs and the lowest lows in my life. Helping with the birth of a foal, getting her through serious illness, and then into the winner’s circle is one of the greatest achievements in my life. Our first mare was Permanent Cut. You’ve heard about her before, and you will again in this and the next post. P.C. 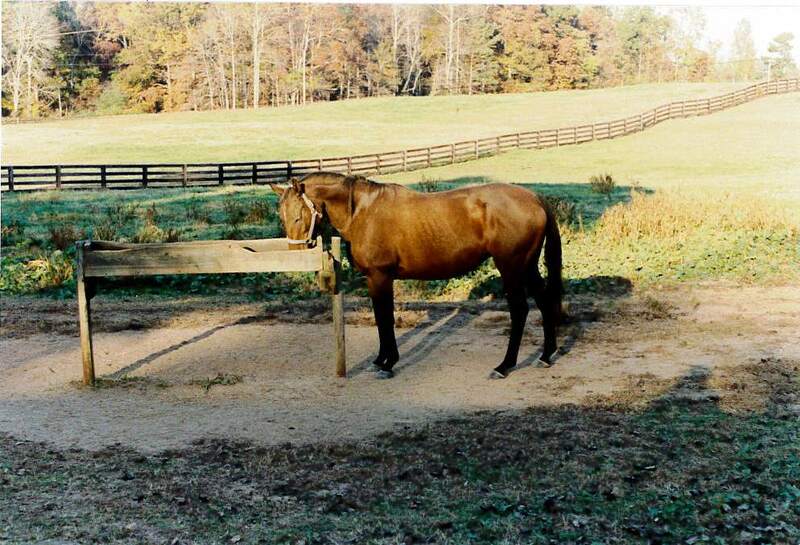 was a half-sister to Cut Away, who ran third in the 1982 Preakness. P.C. was a grand-daughter of the great Ribot and her female family was (and still is) one of the top-producing female lines in the country. She was an easy-going girl who I loved, dearly. I hated to part with her; but, unfortunately, the horse business can be very difficult. After some serious financial and emotional set-backs (including losing our first foal – who we had foaled, raised and raced – to colic), it became clear to us that we needed to sell our horses and leave the business. It was a heart-wrenching decision, but a necessary one. 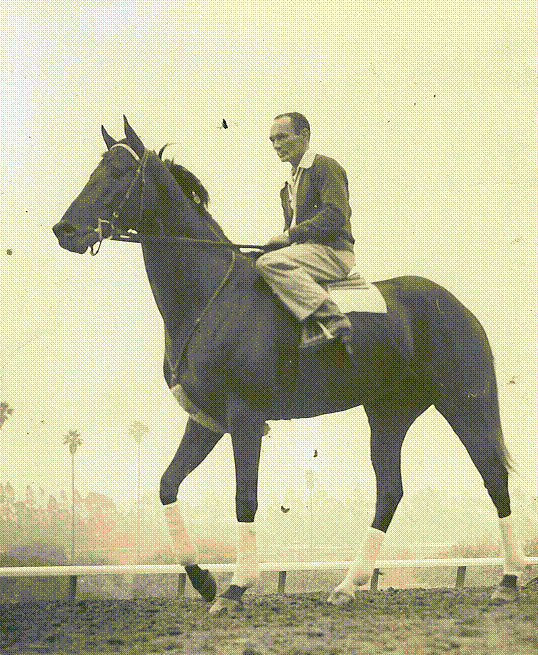 Luckily, we had kept our mares with a terrific horseman in Kentucky. He understood our plight and agreed with us that the thoroughbred business had become a losing proposition for us. He helped us find an excellent home for our girls – Permanent Cut and her yearling filly. I was very happy that the new owner kept us apprised of what was going on with the girls. 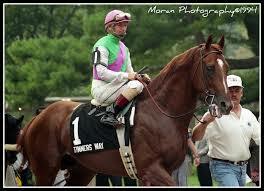 Imagine my joy when I found out that he bred Permanent Cut to a son of Secretariat named Tinners Way. Tinners Way had become a favorite of mine the very first time I saw him. I quickly recognized him as being very much like his sire in looks. 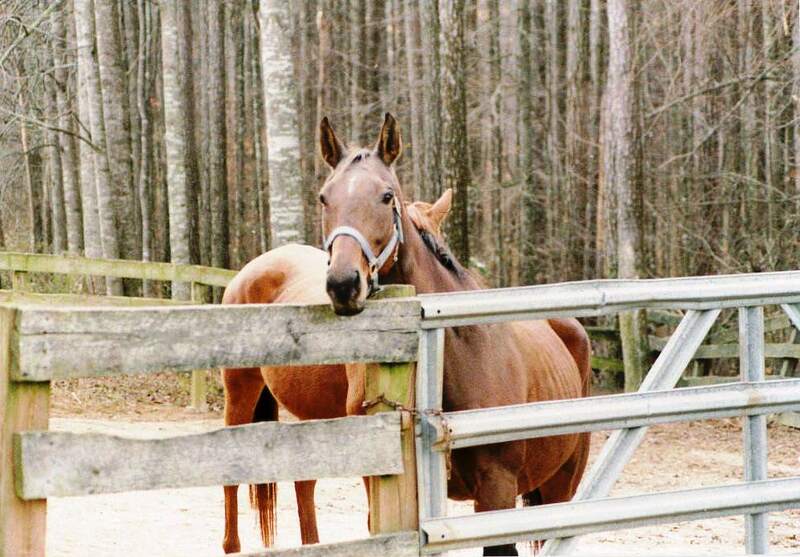 Secretariat had several sons who had his brilliant chestnut coloring, but most of his sons and daughters that I had met had looked more like their dams (e.g., Lady’s Secret – the brilliant race mare – was gray, Risen Star was virtually black). I had also met Academy Award (better known as “Oscar” – a past/passed Old Friends alum) when Permanent Cut was bred to him at Claiborne farm. “Oscar” had Big Red’s coloring, but he was a slighter/smaller version. Tinners is more like his sire in stature, and – as you can see from photos – in his markings. Tinners Way was a foal of 1990. 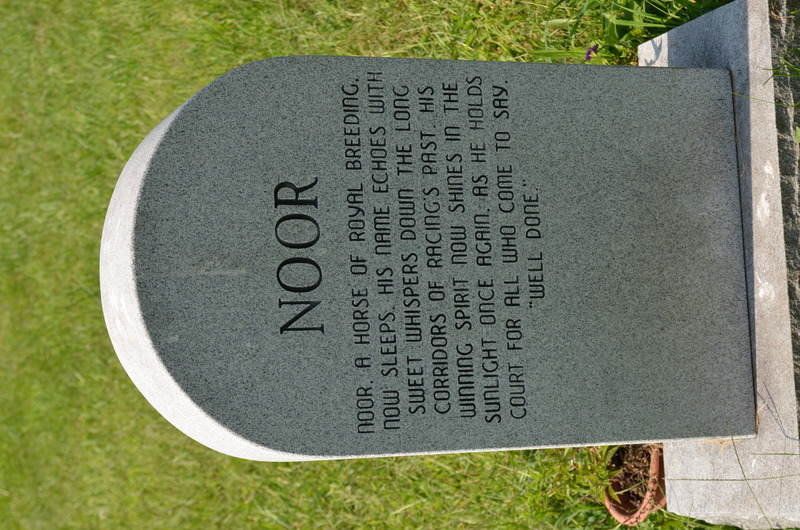 His sire, and arguably the best horse to ever look through a bridle, had passed away in the previous fall. Tinners was a late foal. Thoroughbred horses become “yearlings” the January 1st following their birthday, no matter what month they happen to be born in. Since Tinners was born in late May (the 25th), he would have been at a great disadvantage racing in the Triple Crown races. His owners/breeders, Juddmonte Farms, instead sent the colt to Europe. In Europe, Tinners only had one start as a 2-year-old. That was a win on the turf. 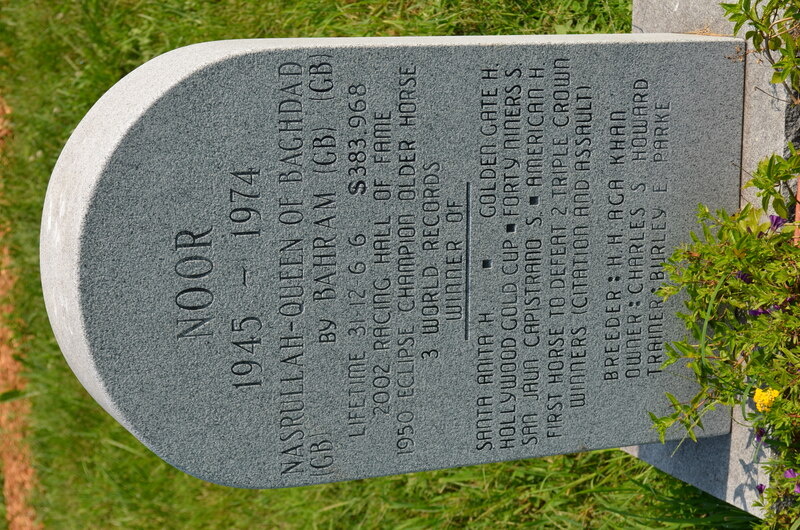 He had four more races in Europe which were all stakes races and in which he won two and came in third in the others. 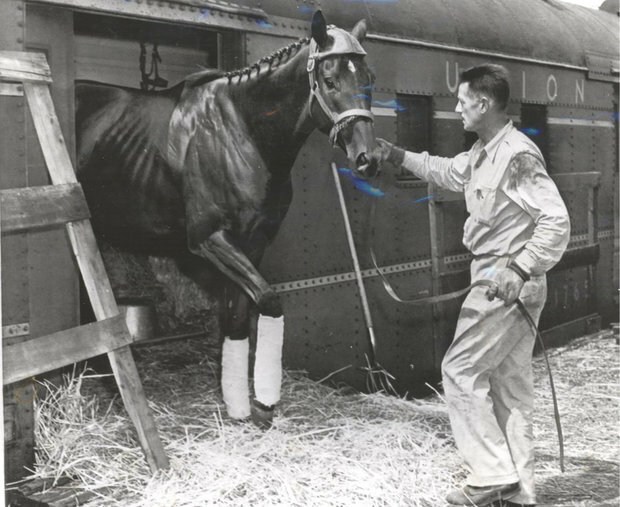 After that, he came to the United States where he ended up in the care of the amazing, Bobby Frankel. Tinners Way won the Pacific Classic (Grade 1) at Del Mar in 1994. In 1995, he won the Pacific Class yet again. 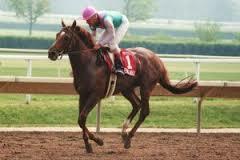 Another stand-out race for him in 1995 was a second in a graded stakes race to the great Cigar. His last Grade 1 win was in the Californian at Hollywood Park in 1996. Unfortunately, in his attempt to win back-to-back-to-back runnings of the Pacific Classic, Tinners Way was injured. He was retired to stud. I had been looking forward to meeting Tinners Way since the moment he went to stud in Kentucky. However, that was at the time that we were getting out of the horse business, and my heart just wasn’t in seeing reminders that we were no longer breeding and racing horses. 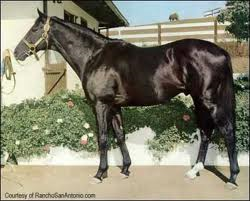 I always hoped, however, that one day I would meet this son of Secretariat that looked so much like his sire. As you will see in an upcoming post, I had been lucky enough to get to know the great, red horse and had visited with him several times. 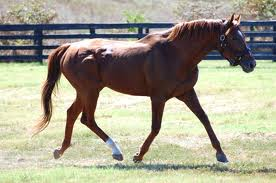 I’d met several of Secretariat’s sons and daughters, but had only found his “spark” sizzling in Lady’s Secret. I wondered if Tinners Way had gotten any of that undefinable quality. I really hoped he had. On August 23 I got the best birthday present ever. 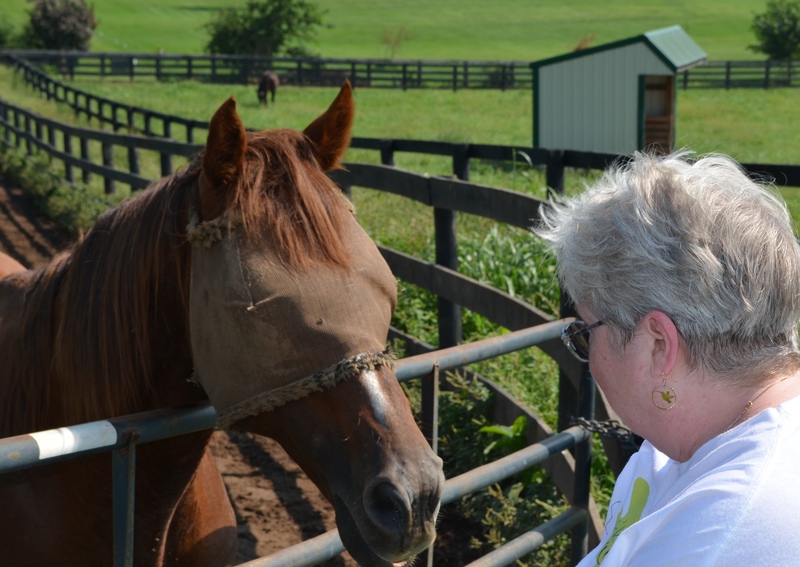 I got to spend time at Old Friends with the wonderful people and horses. I had told them about my desire to see Tinners Way (he wasn’t on the regular tour at the time). The staff gave us permission and told us where to find him. It wasn’t far, but there had been so much rain that the way was excessively muddy. I wasn’t to be dissuaded. They also told me that Tinners could be a bit stand-offish. They warned me not to be disappointed if he stood up in the corner of his paddock and didn’t come down to visit. I told them I understood, but still wanted to at least see him from a distance. They shouldn’t have worried. I called out to Tinners when we were walking up to his paddock. He lifted his head, turned, and started trotting down to the fence. He was wearing a fly mask, but I could see through it that he was, indeed, his father’s son. There was a look of welcome there. Certainly, a large part of his welcome was for someone bringing carrots, but I really felt as though he could tell that I was someone who appreciated him. I immediately got tears in my eyes because his gentleness and self-awareness was much like the way his sire was with me, years ago. He doesn’t have the amazing “presence” Secretariat had – doubt another will – but he did have a calm acceptance that was endearing. I could have stayed there at the fence and talked to him all day. Unfortunately, time to head home came much too soon. I made a promise to myself that I would be back for another visit before too long. We went back up to the Old Friends office where I immediately bought a “share” in Tinners Way. 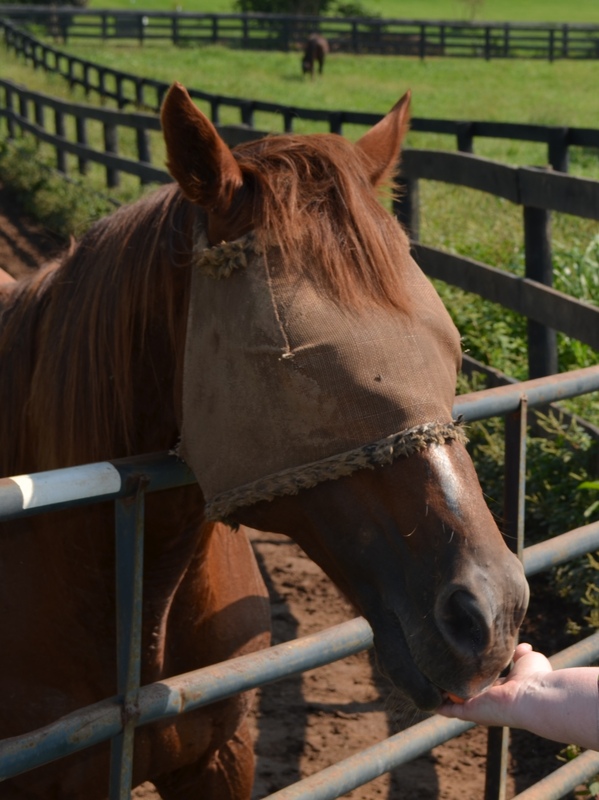 A share is a $100 donation that helps Old Friends pay for the marvelous upkeep of their horses. 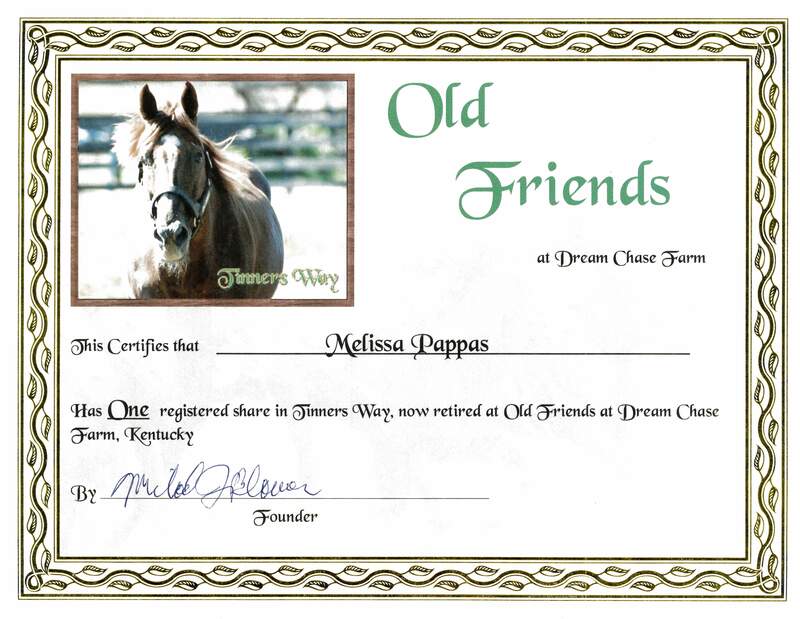 Shares are available for all of Old Friends’ wonderful equine guests. I had purchased a share in Bonnie’s Poker a few years back, and intend to make it a yearly donation for Tinners Way. It’s a tangible way to be involved with the horses. Old Friends later sent me a beautiful certificate and photo along with his information page. I also saw that Old Friends had bracelets made from the manes of several of their horses available for purchase. I asked that they call or email me when they had one made from Tinners Way’s mane. I am proud to say that I now have two bracelets. You ARE Going to Give Me That Carrot, Right? Let me emphasize, again, what an amazing job everyone at Old Friends does. From their beginnings with only a few stallions, Old Friends has grown into the best place on the planet for horses to go when they retire from either the breeding shed (in the case of stallions and mares) or the racetrack (in the case of the geldings). It takes a great deal of money to support all these horses and give them the kind of life they so richly deserve. Old Friends gratefully accepts donations (and they are a tax-deductible charity) and has some terrific items for purchase (some on Ebay) which all go to help the horses. Please check out their website (www.oldfriendsequine.org ) and see if you, too, might want to be one who helps Old Friends and their tremendous mission.